I would like to thank everybody of the TAACO Executive Committee for sending me to New York City to attend Prime minister Ecevit' s visit to the Turkish Center. I had a very pleasent trip and took several pictures which I will share with you along with this e-mail. Unfortunately my trip turned out to be more of a touristic one than a business trip for TAACO. I was very disappointed, except for Mr. Ecevit's speech there was no scheduled meeting of any kind. Apparently the Turkish Business Forum had invited the delegation to lunch earlier the same day. The delegation consisted of The Prime Minister Bulent Ecevit, Foreign Minister Ismail Cem, Minister in Charge of Economic Affairs Kemal Derviş, other ministers, members of Parliament, businessmen including Sakıp Sabancı and members of the media. The total number was close to 200. The meeting was held at the "Türk Evi," a very nice facility located at the United Nations Plaza between 45th and 46 th streets. When I arrived at the building the Turkısh Secret Service probably thought that I was an VIP and showed me to a room in the first floor. There were men and women in dark suits like myself standing along the walls. When I introduced myself to a gentleman near me, I learned that all these were The Turkish Mission to the United Nations waiting to greet the Prime Minister. However the Prime Minister was going to deliver his speech in the second floor. Quietly, excusing myself I left the room, which I was later going to regret. Because this would have been my only close contact with the Prime Minister, where I could have presented him our gift, a nice book about Ohio and it's famous people. The room in the second floor was set up like a classroom with rows of chairs wall to wall. On the walls, one could see nice paintings of Istanbul. 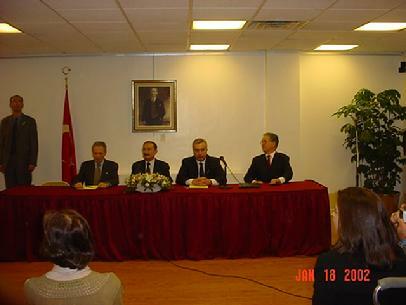 On top of the speakers' table there was a picture of Atatürk, the same one we have at TAACO. I would estimate the crowd around 300 plus people. I talked to few people around me who were mostly from New York. At 3 P.M. there was not even a standing room left around us. 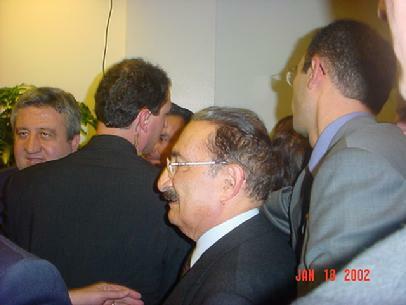 Mr. Ecevit came into the room circled by the Secret Service. It was like the "Pope " entering the room Everybody got up. It was very difficult to see him because of the crowd. He was smiling, his hair a mixture of white on top and a reddish black on the sides; neatly groomed to the back. He was helped to his chair and everybody sat down. Mr. Loğoğlu, Turkish Ambassador to Washington, took the stage; welcomed the Prime Minister and the delegation and introduced the President of Turkish American Business Forum. The young gentleman gave a short speech which was followed by speeches of the incoming and outgoing presidents of ATAA. No acknowledgment of the invited Assembly members and it's presidents were made. After these brief speeches, Mr. Ecevit took the stage. A summary of his speech is attached to this email. Contrary to the local Presidents, Mr. Ecevit introduced his ministers one at a time, and acknowledged the businessmen and members of the Media accompanying him. After his speech was over he took few questions from the audience. When the meeting was adjourned I tried to get near the Prime Minister to give his gift. Earlier the Secret Service had told me to give the gift through the Ambassador, Mr. Loğoğlu. However, I never had the chance because he came and left with the Prime Minister. Anyway I could not give the gift, but I took some pictures instead, which will be my gift to you. Afterwards we went downstairs and exited the building. Most businessmen went across the street to their bus. I had the chance to meet and get my pictures taken with the flamboyant President of Besiktas Soccer Club, Serdar Bilgili. I talked to few members of the media and left the scene with an empty feeling. Due to my flight arrangements, I stayed an extra day and night in New York. 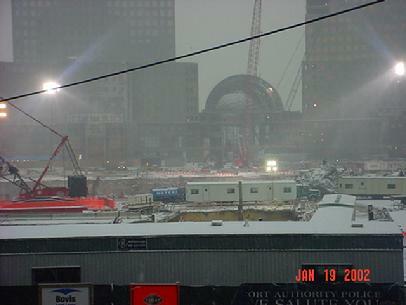 The next day I took the subway to downtown and visited Ground Zero. 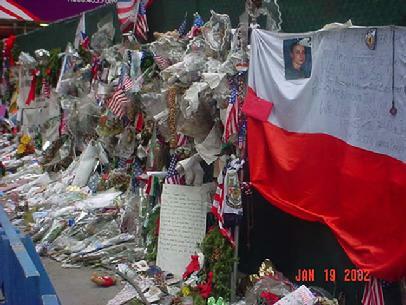 There were flags and memorabilia from September 11, everywhere. People of New York seemed to be proud of their city, and were more helpful to tourists than ever before. I visited Saint Paul's Trinity Church, the American Indian Museum at the Old Custom House, went to WallStreet, took pictures of New York Stock Exchange, the Bull, etc... 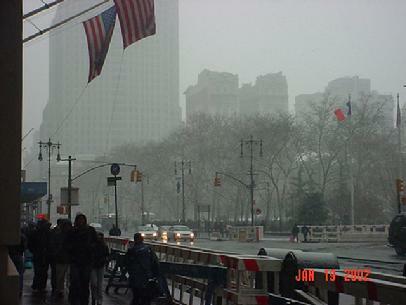 It started to snow in the afternoon, and New York looked beautiful under the snow. I treated myself to sweet peanuts from a street vendor. The peanuts had a sweet and salty coating, and they were hot. Yum!! Finally it was 4 o'clock, my ticketed time to visit ground zero. My feet were freezing as I watched the big emptiness and the dedicated people working the cranes. I took few pictures, and left the wooden stage with feelings of sadness and lots of emotions This time, I treated myself to hot coffee, and a garlic pretzel, before taking the subway to Uptown to my hotel. Again my thanks to everyone, highlights of Mr. Ecevit's speech and pictures will be attached to this e-mail. This article was written in January of 2002. Since then, lots of things have changed in Turkey and in the world. We have a new Prime Minister, Recep Tayyip Erdoğan and his AK Party in power. The " Iraq war", has drastically affected the relationship between our two countries. Now there is talk about 5000 or so Turkish Soldiers being sent as Peace Keepers ( or "Makers" ? ) to Iraq. Any way, it is not our intention to make political comments in these pages. We will leave this to our readers. A quick look at Mr Ecevit's comments then, and the situation now today, will stimulate such a debate. - Amerika Ziyareti çok başarılı geçmiştir. Amerika Türkiye’yi artık yalnız bir Bölgesel Güç olarak değil, bir Dünya Devleti olarak görüyor ve dünya sorunlarını Türkiye ile görüşüyor. -Eskiden Türkiye ile ilgili stratejik bir ortaklık vardı. Şimdi Amerika ekonomi ve ticaret konusunda Türkiye'ye yeşil ışık yaktı. -Türkiyenin terör konusundaki hassasiyeti kadar, 11 Eylül sonrası tutumu, bu olayın belki de bir dinler çatışmasına dönüşmesini önledi. -11 Eylül eşi görülmemiş, insanlık dışı bir vahşet olmakla beraber tek olumlu sonucu dünya devletlerinin terörizme karşı bir cephe kurmaları, hiç değilse karşı çıkmaları oldu. Türkiye bunun öncülüğünü yapıyor. 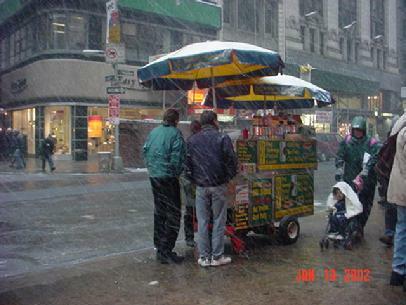 Burada New York ta çok duygusal anlar yaşadık. -Başkan Bush ve eşi ile çok güzel bir yakınlaşma, adeta aileler arasında yaklaşma oldu. -Kıbrıs konusu hiç gündeme gelmedi. Başkan Bush bu konuda en ufak bir dayatma yapmadı. sorunların diyalogla halledilmesini temenni ettiğini bildirip konuyu açmadı bile. -Afganistanın yeniden yapılanması konuşuldu.Türkiye daha Cumhuriyet öncesi, 1920 ler de Afganistan’a yardim etmiştir. Şimdi inanılmaz ama, Afganistan da Konservatuvar açmıştır. Okul açmıştır, devlet dairesi açmıştır. -Afganistan ordusu olmadığından, çeşitli kabileler içinden Taliban meydanı boş bulduğundan bu günlere gelinmiştir. Bu konuda Afganistan'a yardım edebiliriz. Bu konuda Türk ordusu dünya standartlarında başta gelen ülkeler içindedir ve çok deneyimlidir. -Amerika’daki Türklerin lobilenmesinde yarar vardır. Bu lobi özellikle ekonomik ve ticari konularda olmalıdır. Size Türkiye de çok bürokrasi var diyebilir Amerikalılar. Meclis’den yeni bir yasa çıkardık. Eskisi gibi senelerce surence mede kalmayacak , en çok üç ay içinde anlaşma imzalanıp ticari süreç başlayacak. Biraz da saygısız soru sahibi, “bir Türk dünya’ya bedel, ama iki Türk birbirini mahveder. Bunu nasıl değiştireceksiniz?” gibi bir soru sordu. Ecevit bu devirlerin geride kaldığını, bu hükümetin farklı siyasi görüş ve kültürden gelmesine rağmen uzlaşma içinde zorlukların üstüne gittiğini ve muhalefetinde yardımları ile yasaların çıkarıldığını belirtti. Soru sahibinin lafını kesmesine de :” sözümü bitirdim” diyerek konuşmasını bitirdi. Sayın Başbakan konuşmasını irticalen yaptı.Son derece akıcı ve arı bir dille konuştu. Arada hiç duraklamadı. Belki de tek durakladığı anda fikirlerini toparladı ve “Türkiye’deki Müslümanların bütün dünyaya; müslümanlığın barışla,laiklikle ve çağdaşlıkla nasıl bir uyum içinde olduğunu gösterdi” diye vurguladı.